“There are two ways to enslave a nation. One is by the sword. The other is by debt.” There is an ongoing debate on the internet about whether or not that quote was first said by John Adams. Regardless, the quote is very powerful with its meaning. Debt is slavery. 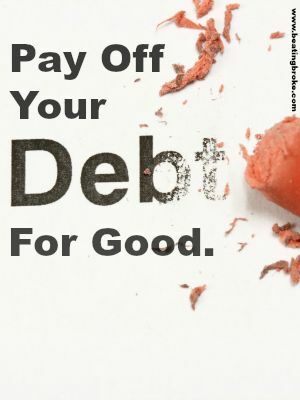 With debt you are controlled by the person in which you owe. If you don’t believe me, stop paying your monthly payments on your house, car, or other loans. The bank or other creditor will come along and seize that asset from you or other assets that have been used as collateral. Debt is very powerful and can take a massive financial and psychological toll on us. Paying off our debt can lead to previously unfathomed levels of financial freedom and happiness. I’ve started Young and Wealthy Living to help others realize this dream. Today, we will observe multiple methods that can be used to pay off different types of debt faster by taking various steps. If you’re like most people, you have many different forms of debt. These could be a credit card balance, mortgage, student loans, car payments, or personal loans. If you are looking to make more than just your monthly payments on these loans, I commend you, this is the first step to finally becoming debt free. But you may be wondering, which loans should I put the extra payments toward? To answer this we will use the debt stacking method, as I strongly believe that this is the best way to attack debt. It’s very simple and straightforward. Put extra payments to the debt with the highest interest rate and pay the minimum payments on the rest of the debts. The reason this method works is that over time you will be able to accelerate how quickly all of your debt will be paid off since more and more of your payments will be going towards the principle instead of the interest. Using the debt stacking method you will pay less in total interest and you will have all of your debts paid off faster than if you just used the shotgun approach on your debt. If you’re like me, you graduated with student loans consisting of private and federal loans. My student loans ranged from 3% interest to 6.8% interest. If you plan on taking the full ten years to pay off your student loans, you could be paying thousands of dollars in interest alone over this time period. If I had only been making the minimum payments on my loans I would have paid over $10,000 in interest alone. To help lower your monthly payments and literally save yourself potentially thousands of dollars in interest, you can consolidate all of your loans into one loan. Yes, you read that correctly. Not only does this give you only one loan to have to keep track of and remember to pay, but it would most likely lower your interest rate and save you money. A couple of good resources for this are Sofi and Earnest. You can also check with local credit unions as many of them offer this service as well. There are a couple things to note, however. First, many services will require that you be employed or have an offer of employment and some might require that you have an emergency fund setup. Continue to make the larger payments you had before consolidating and you will have your student loans paid off ahead of time! The average credit card debt for American adults with a credit card is $5,047 according to creditcards.com. Unfortunately, credit card debt is usually the most painful because it typically carries the highest interest rate of debts people are likely to have. It is not unlikely to see credit cards with an APR of 15% to 24%. If you are carrying a large balance on your credit card you can expect to pay thousands of dollars in interest before your card is paid off and have it take years to do. The key to lowering your payments on the credit card debt is to lower your interest rate. This will allow you to pay off that debt faster and potentially saving you thousands in interest payments. The first method here if you have a high credit card balance and are struggling to make your payments is to transfer your balance to a new card that offers an introductory offer of 0% interest on balance transfers. A couple of great cards for this are the Chase Slate and Discover It cards. This introductory rate is only good for a period of time however, typically 12 to 21 months, before it increases to the typical 15% – 24%, so you should be paying as much as possible during this time as 100% of your payments would be going towards the principle. Again, there are a couple things to note here. Sometimes there is a fee to transfer a balance, oftentimes of 3% – 5% and you will need good to excellent credit to qualify for the best offers. Another method you should try if you have not already: simply ask. Just call up the credit card company, be very polite, and explain to them that you would love to pay off your credit card debt but the current interest rate makes it very difficult for you to make extra payments. Then ask them if they could lower your interest rate for you. You may initially get a ‘no’ but it is very likely that you will need to go through several people in the company before you reach someone that has the authority to negotiate this. Just remember to be polite to the person on the other end of the phone and they will be willing to pass you along to someone who can help. You may think the credit card company doesn’t care about you and if you can make your payments or not. But the truth is they absolutely want you to make your payments and have a payment plan you can afford. They would much rather work with you and have you pay off your debt than to sell your debt to a collections company for pennies on the dollar. Of course, these are not the only methods you can use to decrease payments and pay debt off faster but we all have our favorites and those we believe to be the most effective. Recognize how debt has the ability to control you and make a plan to attack it and you will be well on your way to wiping out your debt and becoming debt free! Feel free to share your debt elimination plans and stories with me by emailing me at nic@youngandwealthyliving.com. Together we can conquer our debt and be on the path to financial freedom! I decided to become a personal finance blogger because I have had family and friends ask me for advice on their personal finances for years. After continuously being asked for advice, I thought, if my friends and family are asking me all these questions, they’re certainly not the only ones seeking answers. And with that, Young and Wealthy Living was born! I blog about my personal financial beliefs, how I became financially free, and what you can do to be well on your way to financial freedom! So come join me, and together we all can realize financial freedom.